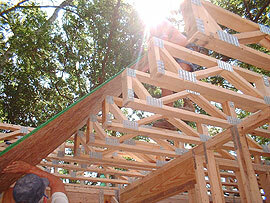 The day started with stella work in getting the remaining floor trusses alligned, set, and nailed ready for the second story floor. 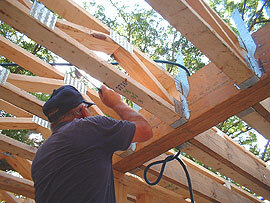 Here’s Frank nailing special strengthening hurricane clips to integrate the laminated beam with the floor trusses. 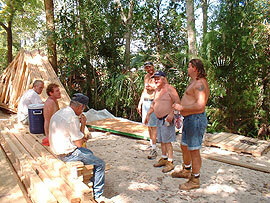 Soon, it was time to lay the second story floor. Here’s Jim handing up a floor section to Hollywood. 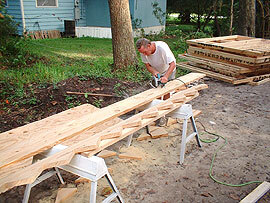 These boards come in standard sizes so a skillsaw “ripping” station was set-up to size them as required, as well as construct the stair stringers (zig-zaggy side pieces that hold the step treads. Using a big hammer, measure, level, glue and nail gun, the floor was laid quickly but carefully. Each section was handed up as required to Hollywood and Mick. Here’s the “ripping” station. Glenn is carefully cutting step sections out of three 2x10s to get them ready for fitting as stair stringers. 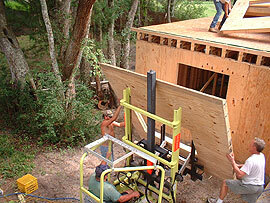 In the background are a pile of second-floor interior walls. 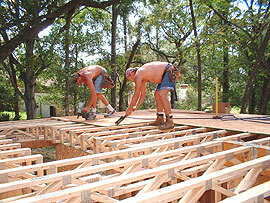 Soon the floor was complete and we were ready for second story exterior walls to be raised to the upper level. Here are Frank, Hollywood and Glenn manhandling the largest of the wall panels onto a special type of balloon-tired fork lift called a “Donkey”. 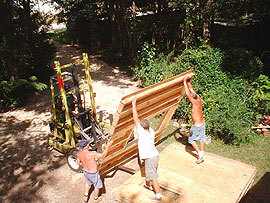 Here the Donkey driver is lifting a panel to the second floor, supported by Holywood and Glenn, while Jim, Mick and Pat lay the previous panel on the floor. It took a concerted effort by the whole crew to get the heavy exterior wall panels onto the second floor but it was done in less than 35 minutes. In contrast to the day before, the fourth day saw a lot of great progress and the crew were jubilant by their “wind-down” period at the end of the day. Here’s Glenn, Pat, Jim, Hollywood, Frank and Mick kicking back, feeling good about themselves.